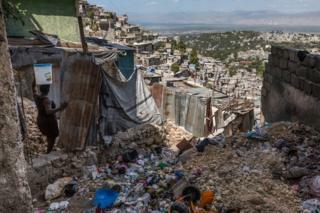 Behind the brightly painted exterior of Jalousie, one of Haiti's largest slums, lives a community struggling with a lack of sanitation and running water, intermittent electricity and rivers of plastic waste. Conservative estimates suggest more than 80,000 people now live in Jalousie. 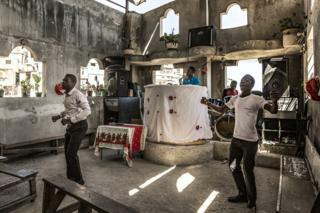 Many of them moved here after the earthquake which devastated much of Haiti in 2010. Jalousie was spared the worst of the damage and as a result became even more cramped. But although life is often chaotic and challenging, residents manage to find dignity, hope and a sense of community, regardless of the challenges of poverty and oppression that they face. 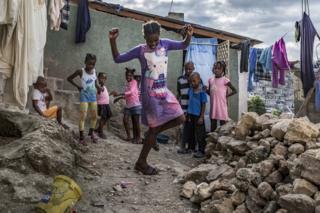 Most visitors to Haiti's capital, Port-au-Prince, only get to see a fleeting glimpse of Jalousie from the road, as they go past its collection of pastel-coloured shacks clinging to the side of the steep Morne L'Hôpital mountain. The houses were painted by the government in 2013 as part of a $1.4m (£1m) project which many locals mockingly refer to as "the Botox". 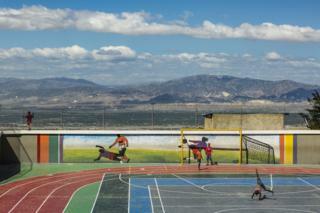 Critics have suggested that the motivation for the project stemmed from the fact that Jalousie is visible from the wealthy district of Pétion-Ville. 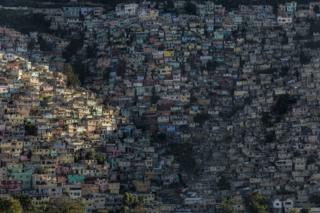 They argue that the money could have been better spent on improving the slum's water and electrical supplies rather than improving the view from the refurbished villas of Pétion-Ville down below. Stepping inside this 60-year-old, almost-vertical slum area, between tightly packed cinderblock homes, it is not hard to see how it earned its nickname "misery in colours". When the tangle of wires illegally tapped into the grid gives out, candles and lanterns light the way, families burn charcoal to cook, and when it rains, rivers of plastic rubbish collect in front of people's homes. Yet amid these conditions of extreme poverty, the residents of Jalousie work hard to retain their dignity and pride in their surroundings. 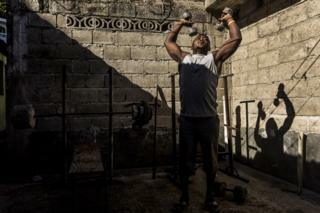 They set up makeshift gyms where they work out using weights made out of cement, play sports at Jalousie's main arena or attend one of the many churches. 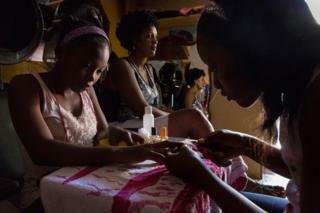 People in Jalousie have also set up small businesses such as beauty salons or restaurants to try to make ends meet. 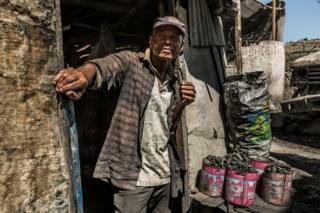 Loreu, 62 (below), runs a shop selling charcoal. The father of four has lived in Jalousie for more than 40 years. But despite their efforts, 85% of families in Jalousie estimate that their income covers only part of, or none of, their needs. 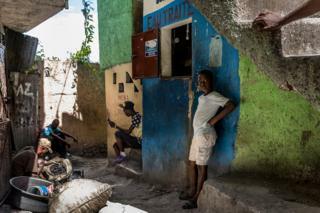 Jean Michelle, 35 (below), works as a car park security guard and has been living in this one room in Jalousie with his three children since 2004. 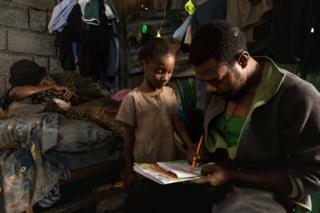 Here, he is helping his seven-year-old daughter Fatdjoulie with her homework while Catrine Telamoure, who also lives with them, takes a nap. 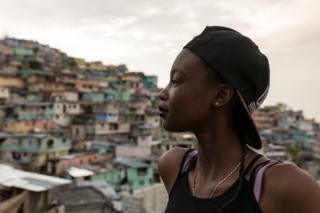 Haiti is the poorest nation in the western hemisphere and has struggled to recover from the 2010 earthquake that killed more than 200,000 people. A recent survey suggests that more than half of its inhabitants live below the national poverty line of $2.41 (£1.80) per day. 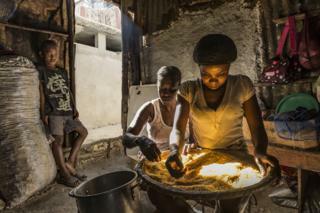 A staggering 74% of Haiti's urban population are now living in slums. 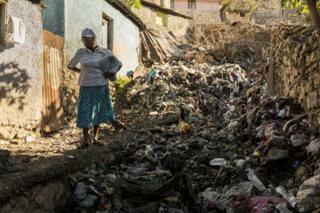 Along with no sewage system or electric grid, inhabitants of Jalousie have no running water. 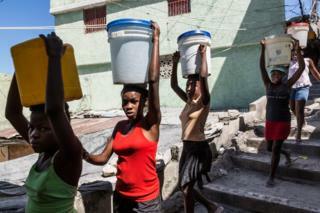 Residents queue at water distribution points, paying $0.35 (£0.26) for a five-gallon bucket. They then carry the 19kg (42lb) buckets up the mountain on their heads. Alongside their daily battles with the lack of infrastructure, schools, toilet facilities and waste management, the inhabitants of Jalousie face an increasingly uncertain future for another reason: a secondary seismic fault line runs through the entire hillside making the area vulnerable to future devastation. There is also a serious danger of mudslides, due to the steep terrain and lack of vegetation, with at least 1,300 unstable homes identified as a threat to residents immediately below them. Words and photographs by Tariq Zaidi.